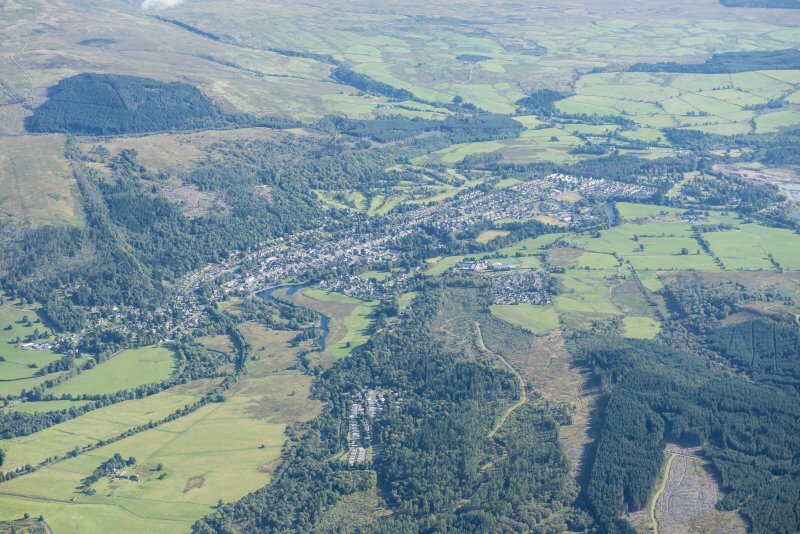 General oblique aerial view centred on Callander, looking ENE. A curious mound, very correctly circular in shape, with a level space at the top 120ft in circumference round the brink. Traditionally erected in memory of St Kessaig. An annual market called Feill-ma-Chessaig was held here in the early 19th century. Flat-topped mote (castle mound) watching the bridge. OS 6" map annotated by O G S Crawford 15 November 1938. A regular, flat-topped mound, maximum height 5.0m. Mutilated on the SE by a modern path. Although the mound has the appearance of a motte, it is impossible to be certain without excavation. No additional information. Visited by OS (R D) 9 October 1968. NN 626 078. This conical mound stands 5m high and its level top is l0m in diameter. It is probably a motte.